At the start of 2012 Sabre, Stray and Halogenix teamed up to drop one of the most blissful pieces of drum & bass that year, ‘Oblique’. Since then the dreamteam have continued their late night studio sessions and are now ready to announce their new collaborative project, Ivy Lab. Hailing from North London, 30 year old DJ turned Producer Gove Kidao aka Sabre has risen through the ranks of the global electronic music fraternity since his emergence back in 2002; Securing as he goes a reputation as a twisted yet soulful thinker, bringing a grittier sound to the deeper spectrum of Drum & Bass and experimental electronica. After having spent his earliest years in the Seychelles, Sabre moved to the UK in 1989. Awed by the richness of the early 90’s UK Music scene; he initially started off as Hip-Hop DJ, switching focus in 1995 to the exciting homegrown movement that was Jungle Drum & Bass. 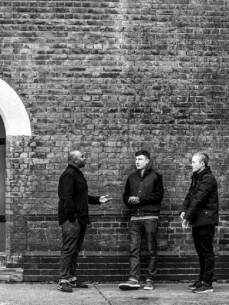 In the years since those first forays into the scene, Sabre has grown to emerge as a key member of a new generation of Drum and Bass producers; set on evolving the scope of the genre – In the process collaborating with artists such as Noisia, Goldie, Alix Perez, Jenna G, Breakage, Icicle, Sam Frank, Rockwell & Ulterior Motive – but to name a few. Spanning many styles, this initially dancefloor-orientated catalog has evolved to include a more experimental outlook, showcased in his 2010 debut LP, but perhaps best represented in his contribution towards the score for the feature film “Black water Transit” – Directed by Tony Kaye of “American History X” fame. Currently resident in Thailands’ bustling capital Bangkok, Sabre continues to produce from his base in this Asian mega-metropolis, returning to Europe throughout the year to tour his residencies and collaborate with his fellow Ivy Lab members. Originally from London, 23 year old Leeds based producer Stray made his first mark on the drum & bass scene back in 2009. Initially known predominantly for a more stripped back sound, he subsequently went on to showcase an ability to lend his hand to a remarkable variety of styles whilst keeping a distinctive quality to his sound. The wide range of influential labels who have released Stray’s music over the past few years reflects the diversity of his output – be it the sparse keys of ‘Pushed’ on Exit Records or the relentless amen workout of his Danny Byrd remix for Hospital Records. A comparatively modest catalogue of releases and DJ mixes displays Stray’s considered approach to his involvement in the scene – his ethos of quality over quantity apparent since his very first release on the esteemed Critical Music imprint. The first collaborations with Sabre and Halogenix were a natural progression due to the trio’s shared interest not only in each other’s works but also in a specific and considered production ethos and sonic goal. With the initial sessions sparking the well-received tracks ‘Askari’, ‘St.Clair’ and ‘Oblique’, the three went on to form Ivy Lab and have been busy in the studio together ever since. The influences of 23 year old, North London based Producer Laurence Reading aka Halogenix have amalgamated to form one of the most versatile producers of today, carving a sound that has become synonymous with the name. Initially a classically trained musician, hearing the affluent sounds of Drum and Bass in the late 90’s ultimately helped develop a love for the eclectic sounds of electronic music. After spending years being an observer of the drum and bass movement, it wasn’t until 2005 that Halogenix started experimenting with production and it was 2010 which saw the birth of Halogenix’s solo endeavours being released into the public domain, releasing tunes with labels such as Critical, Dispatch, Invisible, Warm Communications and Horizons. 2011 ultimately held host to the meeting of the mind’s of Sabre, Stray and Halogenix. Initially starting off as 3 mates making beats, what was realised fairly early on was that there was potential for a lot more. ‘Oblique’ firmly set the path for the cementing of the coalition and after attracting the support of some of the highest celebrated labels and DJs of the moment, Ivy Lab was born.